The Cold Frame is actually a mini greenhouse and is especially valuable in the early spring or fall. They are usually about 2' x 4' in size, have hinged lids for ventilation, and are constructed of wood or aluminum and glass or polycarbonate. Usually the lids slope to allow for rain fall off. They are generally light weight and easy to move from one location to another. 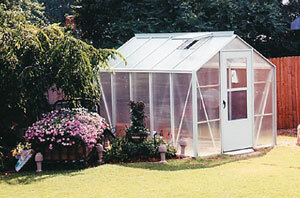 Just like a larger greenhouse, shade protection in spring and summer is recommended, while the winter season requires insulation. Cold Frames are especially valuable in areas where there are no heavy frosts as they will offer enough protection to over-winter tender garden plants. Another good use, remove your crops from the greenhouse and "harden them off" in the coldframe. 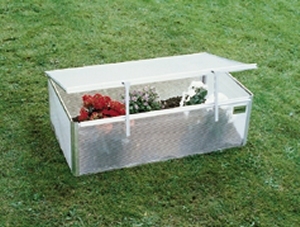 You can also get a jump start on planting your seeds direct into the coldframe. Late vegetable greenhouse crops can also be moved into the coldframe thereby extending their growing season. 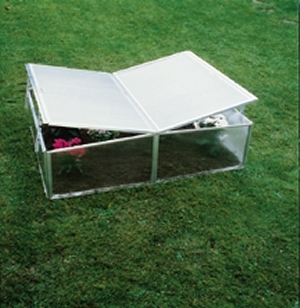 The coldframe is also ideal for forcing bulbs to bloom. The bulbs will still require a 10 week period of darkness. Coldframes and small greenhouses are also a wonderful way to introduce children to the joy of growing plants and vegetables in their own mini greenhouse!